epic fail of the first opening gp is definitely ferrari. alonso qualified 12th and massa 16th!!! this is a disaster start for ferrari really and for loyal ferrari tifosi and the whole country who supports this team must be gutted by this result, i mean since preseason they had this big fundamental issues with the car actually, testing wasn't going well at all, they had tried everything they can during preseason making twigs and changes especially around exhaust, i think team is finding this car very complex to understand this car since this year under the new leadership of Pat Fry as newly promoted technical director *btw ferrari sacked Aldo costa last year during early season i will explain why; decided to take aggressive approach to design philosophy of this year car. they just bowed to the pressure of italian media and went super-radical with their design philosophy, courtesy of Pat Fry who have history of hit and miss designing cars *mclaren for ex, and how the hell they manage to swing the axe on their longest serving technical director Aldo Costa both under all time genius Rory Bryne made race winning cars all years and independently himself had directed pretty competitive car if not winning car. Good for Mercedes we have costa now, Ferrari loss = Mercedes gain. basically aldo costa who was one of the ferrari s longest serving technical director was axed last year in early part of the season because the 2011 season car wasnt competitive to challenge red bull and mclaren. and frankly i was damn surprised by this really. i had this appreciation and respect as a fan of formula 1 that even aldo costa was a TD from rival team he had designed pretty competitive car if not winning car, but yes he is known for being pretty conservative in his design philosophy and not innovative, he doesnt like to take risk with radical designs just incase that will fail, its gamble with time resources something he is not known for, i have read in various tech f1 forums that under rory bryne *who btw designed championship winning cars for both benetton and poached by ferrari alongside ross brawn, well when costa was working under byrne every radical approaches to design and decisions were consulted to higher position staffs like byrne and ross brawn so costa felt comfortable with his position and ever since bryne retired costa took conservative approach in his designs. all of his designed cars bar 2009 season, were all competitive enough to win races, if not winning car. but ferrari got fed up with being conservative, especially everyone media, fans, even amongst inside the team *according to my knowledge ... incl. domenicali and tombazis who at the time under costa was head of aerodymanics and chief designer of the car, ... well costa was basically branded to be conservative in his approach and not much leaving innovative or radical approach to design philosophy ... before beginning of 2011 ... both off the season during designing phase of the times, or during unveiling ferrari CEO luca montezemolo had said he wants to see ferrari competiting right from the start to win, and not playing catch ups anymore to red bull or mclaren. that didnt happen so, lots of accusation fell to Aldo Costa. at the same time during the mid season of 2010, Pat Fry was hired from Mclaren to work under Aldo Costa as assistant TD. so in early season of 2011, since after few races ferrari acknowledged they were far away from red bull and mclaren in terms of performance especially in aero department, and oh btw during early 2011, the correlation didnt match in the track to what team had observed in the windtunnel and there were reports with faulty windtunnel issues and i think even ferrari were using toyota facility. anyway so thats the case, aldo was basically accused and pat fry was promoted to TD, during early season. i think aldo was asked to take other positions within the team but read in some interview he wasnt interested. i thought ... ferrari might be very dangerous speedy winning car right from beginning. btw.. aldo costa joined mercedes after ironically ross brawn asked him if he was intersted to work for silver arrows team. aldo says he was pretty happy that he talked to ross brawn and bob bell *btw bob bell was also released by renault, pretty much a bit of a same story with aldo, for some poor results for renault now lotus team with james allison who is now head of the team. as a fan of mercedes im so f... kin happy. ... - short wheelbase, poor weight distribution, i thought they had learned from mistake of 2010 with their same fundamental mistake how the hell they manage to repeat same fundamental mistake again is beyond belief u know. and to copy red bull ... so called blown diffuser which is worth about 1- 1.5 sec a lap, man mercedes i think they really failed to understand in compete how the concept the package works so they didnt manage to get max out of the car. anyway poor reliability poor design it was terrible. thank god bob bell joined in 2011 early part of the season i think he started to work for the team in april that means he wasnt responsible for that poor car of 2011. mercedes switched focus for this year car in mid july, because they knew 2010 car was really poor and isnt worth wasting time and resources for that car and instead should prepare for 2012.
ross was looking both race and factory work all together and he himself was finding hard. plus post honda-brawn gp they had lost in excess of 200 staff ... just 400 staff in the team. so it was disogranized team for a big team like mercedes. so now they have just started recruiting people..
so aldo costa joined the team, bob bell is doing pretty good, geoff willis i know this guy as a fan of bar racing f1 since long long time ... he had worked for bar racing... under pretty low budget team that time, he had really made some awesome podium winning cars, he worked for red bull, HRT ... joining mercedes is like coming home for him... because he knows staff well the factory even the wind tunnel very well, having working as head of aerodynamics previously in mercedes . good thing is that this new rear wing f-duct innovation is helping them atm for straight line speed but they still lack aero performance. red bull performance atm is just a small blip ... they had made last minute surprise bringing major updates in last time barca pre season test, with exhaust concept similar to mclaren and sauber..
really red bull will be back.. after all they have the best genius designer adrian newey fans dont have to worry much lol its just the team is trying make new updates work atm.. i think it will be fine by malaysia race by next race if not this. Peter Sauber has admitted his Swiss team is flattered after Red Bull apparently copied the C31′s exhaust layout ahead of the 2012 season. Red Bull ran at the initial Jerez and Barcelona tests – and then the two opening days of the final Barcelona test – with its own solution in the wake of the FIA’s blown exhaust clampdown. “We had a nice surprise on the penultimate day (of winter testing),” Sauber team boss Peter Sauber wrote in his column for Sonntagsblick newspaper. 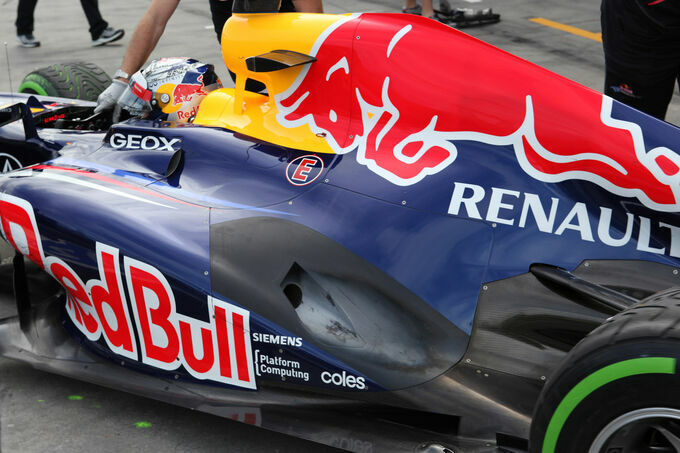 “Red Bull announced their plans to use a heavily modified car, as it will race in Melbourne. “Compared to their first version it had a completely different rear, which differs significantly from most cars – but not ours. 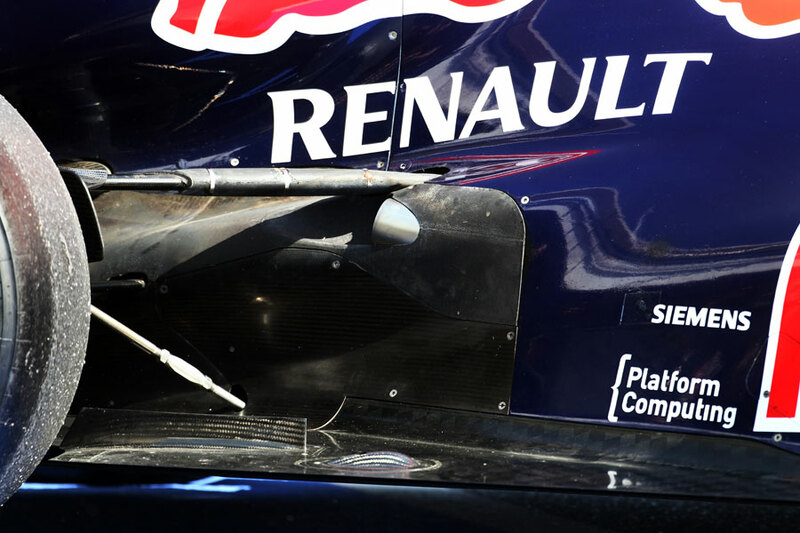 The Red Bull and our C31 have a very similar concept, concerning the management of the airflow at the rear. yesterday besides vettel made a bit of a mistake in his qualy i thought he would have notched atleast 3rd..
btw actually nico rosberg would have qualified in front grid... he made terrible mistake in qualy in first and final sector... he might lost atleast 0.3.
magnificent drive by jenson in the first corner and leading all the way. lewis was good but was very unlucky with safety car because vettel got advantage of it. red bull is a match to mclaren race pace neck to neck. webber had poor start to the race, both vettel and webber being overtaken by rosberg. but eventually the race pace played a great hand for them. biggest surprise, ferrari alonso obviously since he qualified 12th means he started with harder compound of fresh tires with long stint and with pretty good overtakes from start he was already 8th at first lap. good race pace as well. massa was a disaster overtaken by all midfield teams, eventually contact with bruno senna ended his race. biggest fail was mercedes.... how ... how in hell i actually gobsmacked and being so f... kin decieved by qualifying pace, and race pace of preseason testing. williams, sauber, ferrari ... even torro rosso had better race pace than mercedes. jeez if these things are to come, i would be gobsmacked..
biggest surprise was williams, they seems to have managed to bring very consistent race peformance. dissapointed with the fact that mercedes gp hasnt been able to deliver in any way in two years and this doesnt look any better for them. Lotus were indeed unlucky about the fact that grosjean had the accident, and raikkonen's steering wheel was not helping him either in the qualifying. i am glad that button won the race, i dont dislike anyone from redbull,mclaren,ferrari, mercedes, not anyone, but i do want to see vettel lose this one, i want to seem someone else win it or for it to atleast be a hell of a season. Alonso and raikkonen are my favorite drivers.., jepswe what do you think will happen this season for raikkonen? i heard some people say that he said to media that he doesnt feel too confident when his car isnt upto par to his desires... do you think he will have a good season? @The Madrid One wrote: dissapointed with the fact that mercedes gp hasnt been able to deliver in any way in two years and this doesnt look any better for them. i think mercedes have lots of work to do, they have big problems in understanding tyres wear rate, and seems didnt understand how to bring best out of tires in race pace. there was some problems in preseason with tyres degradation but both drivers and team said it was not much to worry. maybe in melbourne race they have different setups. it depends upon race setup-balance, drivers driving style, ambient temp track condition, cornering stiffness vs. load. but as we can see other teams have done lot more better job means mercedes need to study data more, they really need people who can analyse understand and solve race/tires wearing rate more seems they havent done their homework, and that goes since last year car. also, another important aspects obviously is downforce to go easy on tires., and that was evident from preseason/practice/qualy session. if i have time i will go to ask some of guys from tech forums what they think on this guy loic bigois who is head of aerodymanics with mercedes for ages now and apart from Double diffuser, as a fan i kinda feel he has been really poor actually disaster. his track results at williams f1 was poor as well. so if mercedes have now 3 years of working in car that primarily is so poor in aerodynamics ... why keep him.. as head of aerodynamics, i dont think he has done much or like brought anything big differencing performance to aero department, i mean 3 bloody years now. btw geoff willis is a technology director of mercedes now, and he was former aerodymamicist in this team when it was under reign of different owner *bar racing .... under the leadership of david richards who is CEO of Aston Martin Prodrive racing, under really low budget they managed to make podium winning cars consistently so im pinning my hopes that during this season geoff can give a big helping hand and ofcourse aldo costa was a huge figure in ferrari making championship winning cars, so he will bring wealth of experience. though like i said, this car is born under the leadership of bob bell, who i rate high as well so since like i said geoff and aldo joined late they will have no input what so ever means they dont know the characteristics of car, surely they will know from bob and help in development upgrades. i will have my patience with merc for couple of races. the car is good, long wheelbase now means good weight distribution has good low centre of gravity, other features i will write more about them in new post. for raikkonen my friend... seeing his preseason testing and also session in practice .... he is still good. problems was as u said, he had problems with power steering not exactly feeling to his liking to get more of his precise driving style, so actually during practice they had to change couple of times, it will take just few races until they get that balance im sure they will be fine. btw lotus car looks way better, race pace/ qualy pace is just really good actually , mercedes needs to be worried because lotus team is better and has car ability to keep pace with likes of ferrari red bull.... thanks to james allison who is one of my favourite engineer .. TD... i rate him pretty high. for alonso, i was surprised, they maybe worked really hard on race setup, and some changes in car during the evening in practice, they are not allowed to change after qualy, park ferme rule. engineers seems to have worked hefty on best they could do. alonso race pace was pretty consistent, plus as alonso qualified 12th he had chance to start race with hard compound *fresh tyres unlike top 10 cars who have to race with tyres that were already used in qualifying, unless team decides to not go out for run in final session of top 10 qualy shootout ...... which was the choice ahead of option tires for alonso, means he could race for longer stint with hard fresh tires with just 1 stop strategy, and his tyre consistency was really good. unfortunately for u, vettel will be competing for title, his race pace was so good was neck to neck with mclaren pace, webber as well. they just had blip in qualy, and dont forget, red bull had troubles making that final preseason exhaust upgrade work properly, so by malaysia i reckon they will be challenging mclaren for front grid. red bull is on neck to neck with mclaren, even though jenson and lewis got away with 1-3 finish. after all they have adrian newey ... guy is genius... he knows everything that makes car faster than the fastest car in the grid. yah man alonso doesnt need winning cars to win, he just needs a competitive one to challenge anyone... thats what its great about this guy. welll for ferrari i dont want to blame much,. radical design under new leadership of pat fry means they are on new route so it takes time to understand the new car, so .. yeah... i think they will be fine by 3-4 races ... i would be surprised if they wont solve problems by then. dont worry man they will be fine. they will be competitive.. after all they have i think more workforce than any teams in paddock, best facilities in maranello, and one of the best brains behind working for them. after all ferrari is a f1 brand, they will be back. im not ferrari fan but yeah they will be fine. well this year Ferrari took a new route under the leadership of Pat Fry and Nicolas Tombazis taking more important role in car design than previous years being head of aerodynamics. so well i think it just takes time maybe for a new organized staff to gel together. they wanted to build a car they feel they can extract more potential from especially aerodynamics, last year under aldo ferrari obviously felt they were derpived for in season development in aero areas, and couldnt exploit maximum potential out of conservative car. now they have complex car means they can try different things, so i dont know man..
lets see how Pat fry does... he obviously has more bigger and important role he ever got involved in any teams now so ... well i dont know... lets see until half a season goes. i highly rate guy like tombazis... they just are finding difficulties but they have some important changes and updates coming so well lets see. ferrari season would be failure though if they dont start getting this current problem fixed by early european races because not only mclaren and red bull will run away with healthy points, this year the gap is so closed that even small teams are doing impressive job in closing in against big teams. but thats ross lol he is so passionate abour racing it wont be easy for him to leave. Just watched the last race. That was a fantastic and entertaining race. What a crap season this is becoming. 5 different winners from 5 teams so realistically 5 other guys can win. Add 2 Lotus guys and Sauber who were probably the quickest in Malayasia. So 14 guys can win races??? This is getting stupid. Its all rubbish Tyre lottery. Pirelli is trash. My favourite was obviously Michellin followed by Bridgestones. Now they talk of Qualifying tyres to take the focus from rubbish tyres and marbles all over the place. Ohh and this is the ATLEAST the second straight season where Mercedes have a DUD exhaust. 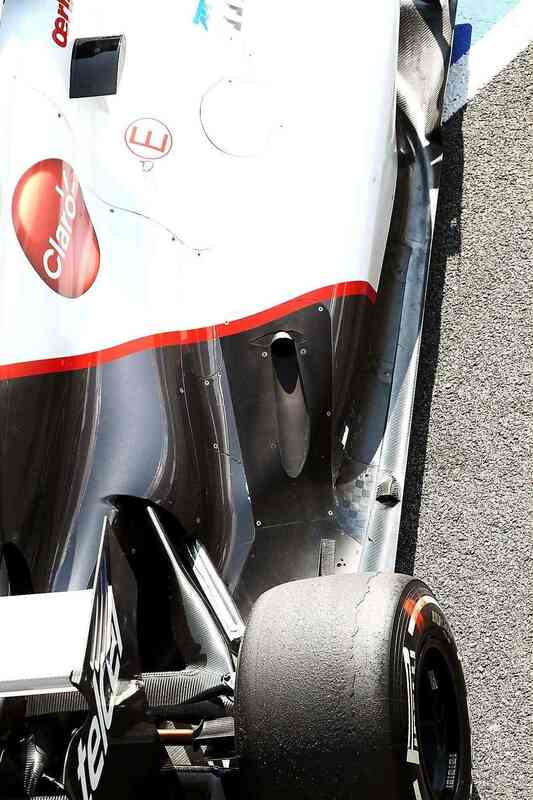 If they cant even copy Mclaren's they will never have any similar amount of downforce. Looking forward to Spa & Monza,my two favourite races.